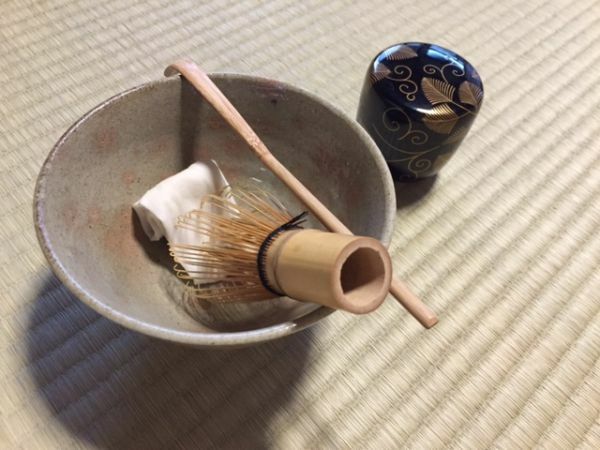 Hello, I’m an owner of Tea Ceremony Koto, just a 1 minute walk from Kinkakuji temple in Kyoto. We will be on the NHK world channel “Core Kyoto” in June 4th. It’ll be broadcast in the north and south America, Europe, and Asian countries except Japan. Today, cameramen and staff visited KOTO to make a film. Insho- Do-moto (1891-1975) is the artist who had been working in Kyoto. 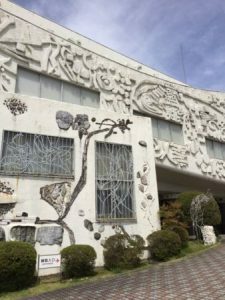 We can find a little bit curious white museum in front of Ritsumeikan University Kinugasa campus walking 12-13 minutes from Kinkakuji temple. From its original looking, we can see the whole building is the art work by him. Even the doorknob is the special art here. On the other hand, Sasasya Morie is the near sweets shop from KOTO. It’s one of the traditional sweets shop I often buy. 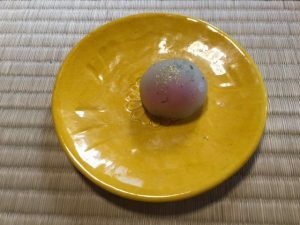 They usually make sweets which represents Japanese seasons, but today’s special ones were made from the paintings of Insho- Do-moto. The beautiful Japanese sweets’ art ! The main cast for today was Japanese sweets. The staff of NHK world channel chose the plates which suit best for these special artistic sweets. They have chosen the colorful small circles for them although I prepared many kinds of plates. This is “Princess Konohana Sakuya”, who is the famous paintings of Insho as well as the lady written in “Kojiki” in the beginning of 8 century. Since he described the paintings related to both Buddhism and Christian, he wanted to express the ritual spirits or stubborn faith without any borderlines between them in his art. I think his painting “Princess Konohana Sakuya” is one of them. 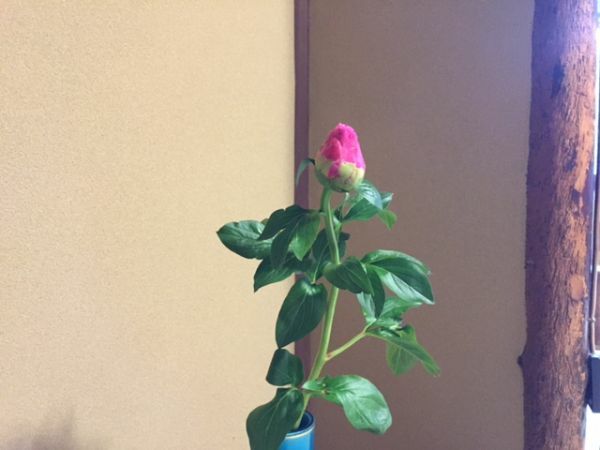 This sweet express the beauty of her as well as the frail life like flowers. 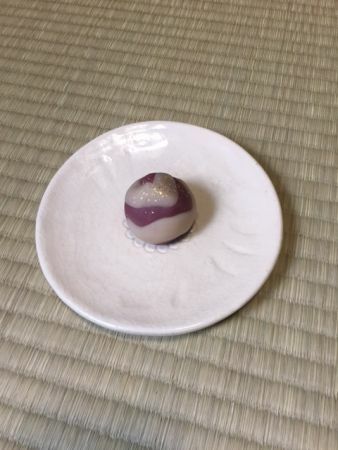 The artistic sweets in the traditional tea ceremony. 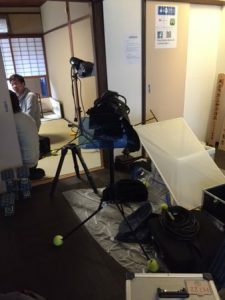 Today Tea Ceremony Koto was filmed for NHK Core Kyoto. I used a simple tea bowl called “Suehiro” which means happiness in the future and a black tea container with pine tree paintings to show the sweets more beautiful. “Ko-Kyo-“means the orchestra. 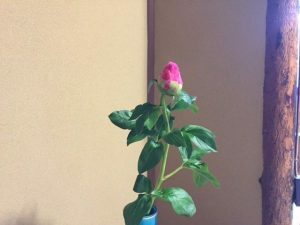 Insho expressed the music by the painting. It’s original and novel! Look at this beautiful blue! 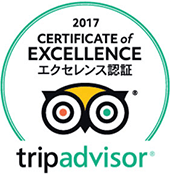 It was also made by seeing the art of Insho- Do-moto called “Amanogawa”(milky way). 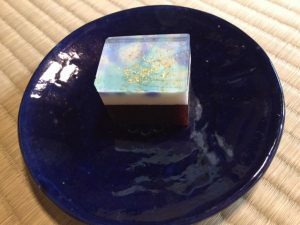 It’s fantastic sweets for the star festival (Altair & Vega) day in July 7th. Not only the looking but also the taste of the sweet beans are very nice. Although I can’t watch the TV program in Japan, I’m looking forward to seeing it via internet. Please don’t miss NHK Core Kyoto in June 4th!